Find your inner peace with your own mini zen garden, also known as desktop zen garden. If you are stressed in your everyday life, you can make a tiny trip to Japan and escape distracting noises and thoughts by meditating with mini zen garden on your desktop. Here you can find the meaning and benefits of mini zen gardens and reasons why you should have one. Make your life a bit more zen – everyday. Zen gardens, also known as Japanese rock gardens or dry landscape gardens, were classically created at temples of Zen Buddhism. They were intended to imitate the intimate essence of nature and they were places where people could meditate about the true meaning of life and find their inner peace. 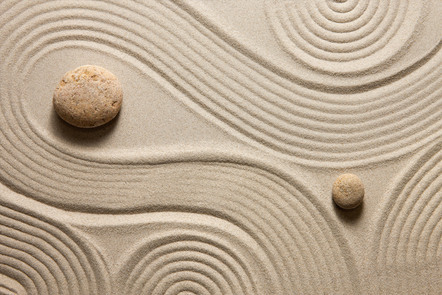 Simply, zen gardens were designed to stimulate mediation. Zen gardens are usually composed of gravel, sand and rocks. However, they can also include small bushes and water features. In addition, all of the features have specific symbolic meanings which makes zen gardens so unique. SAND AND GRAVEL – Gravel is less disturbed by wind and rain so it’s rather used than sand. Gravel and sand symbolizes water – purity, emptiness and distance. RAKING – The act of raking the gravel into a pattern represents of waves or rippling water. Raking is meant to help to practice concentration. Perfect lines are not easy to achieve so it’s a great way to meditate. Developing variations in patterns are inspiring and creative challenge. ROCKS AND STONES – These elements can symbolize various of meanings. Stone arrangements usually represents such as mountains, islands, rivers and waterfalls. One stone could represent a boat or a living creature like a turtle. Group of stones could symbolize even a crane in flight. Shortly, stone can have a meaning what you give to them. While these gardens are very common in Japan, in western countries we don’t always have a peaceful place to clear our mind. With mini zen garden, also known as desktop zen garden, you can have a piece of zen in your home or working spot. Next you can find out the benefits of these mini zen gardens. 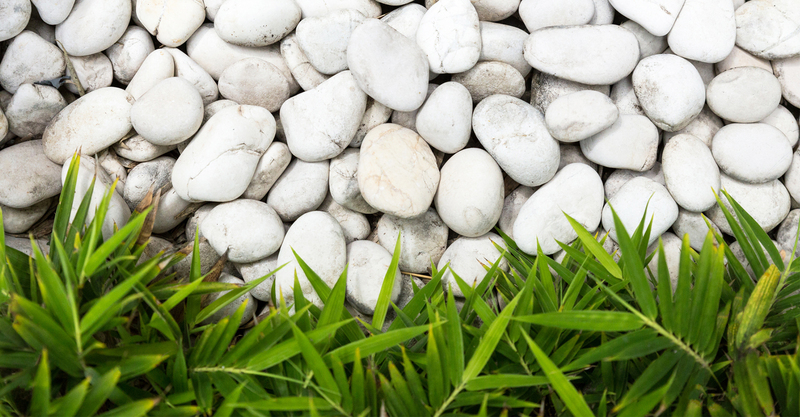 Not everyone has the time or space to build a real full-sized zen garden on their own but everyone can build a mini zen garden on their home or office and enjoy the benefits of zen garden. One of the most important benefit of mini zen garden is stress relief. By raking sand and arranging the stones, you start immediately to relax. Repetitive movements helps to focus on the present and forget the past and the future. This way you get to escape your busy life and stress whenever you want – even in your office while taking a break. Meditating with desktop zen garden can help you achieve wider perspective. You could practice mindful breathing and try to empty your mind. You might come across with arising thoughts but just let them pass. Recognize them and let them peacefully float away. Eventually you will notice that your mind will quiet itself on its own. You can also stimulate your creativity with mini zen garden. 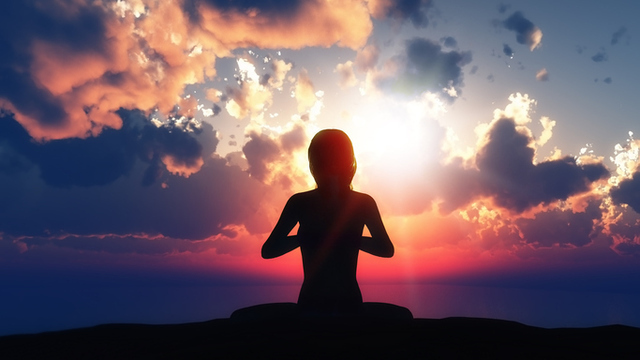 Meditation improves divergent thinking and a fertile inner space in which new ideas can emerge and flow. Presence of zen garden can also assist problem-solving and practice your mindfulness. 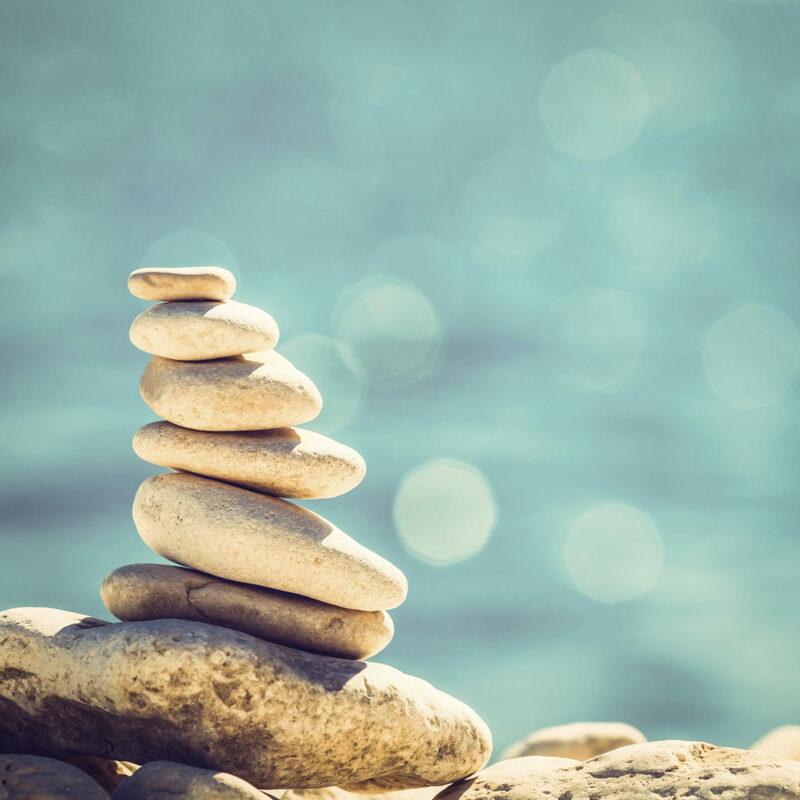 A mini zen garden in your desktop is a constant reminder of staying focused and dedicated. Meditation helps to improve your patience and self-control. The Japanese concepts of Kanso and Fukinsei, simplicity and asymmetrical balance, contributes to mini zen gardens grace and appeal. Zen garden improves feng shui in your home. There are mini zen garden kits for every taste and decor; from just a basic desktop garden with sand and rocks, to very detailed and extremely beautiful artistic designs. 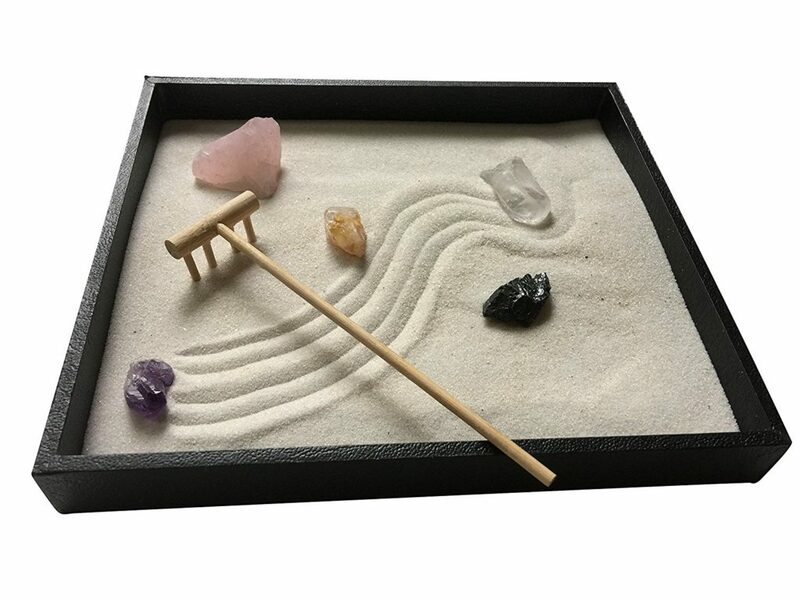 A mini Zen Garden kit includes at least objects as wooden tray, stones, sand, and wooden rake. Some kits includes also small decor such as a small statue, candle or incense holder. There are multiple mini zen gardens in the market but it’s hard to choose which one is the best option for you. I have gathered here the most useful mini zen garden kits. 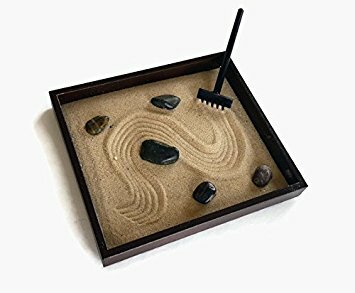 This basic black zen garden kit contains a wooden box, handmade mini rake, sand and stones – all you need for your first mini zen garden. There’s nothing extra, just the basic stuff. This kit is great for beginners and those who value simplicity and handmade products! This beautiful deluxe sized 9-inch by 9-inch kit is made from rosewood and is perfect for coffee table or office. This kit includes three different rakes; a long-handled rake, a bamboo rake and a broom to create unique and beautiful patterns in the sand. It also includes polished stones and two ceramic cranes. This kit comes with 64-paged meditation booklet with useful instructions for shaping the garden. This is great for beginners also! This kit is definitely best choice for stimulating your creativity and presenting your personal style. 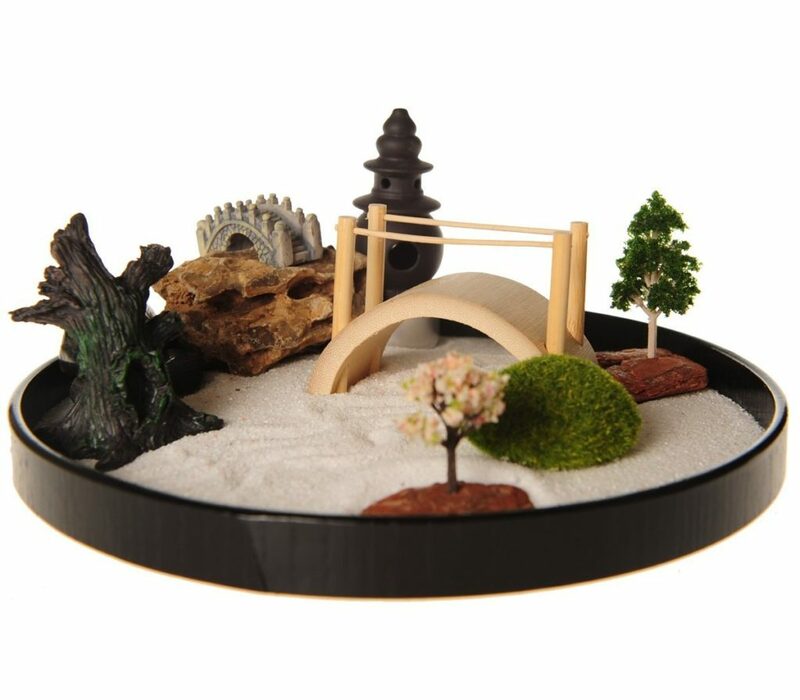 If you don’t want a original basic zen garden this kit is your best choice as it comes with various different objects such as stones, boat bridge and bushes. The tray is quite big; it’s 12.1 x 11.2 x 3.4 inches. Object are also made with high quality materials so this kit is worth to buy. Just an empty tray for you to bring to alive! 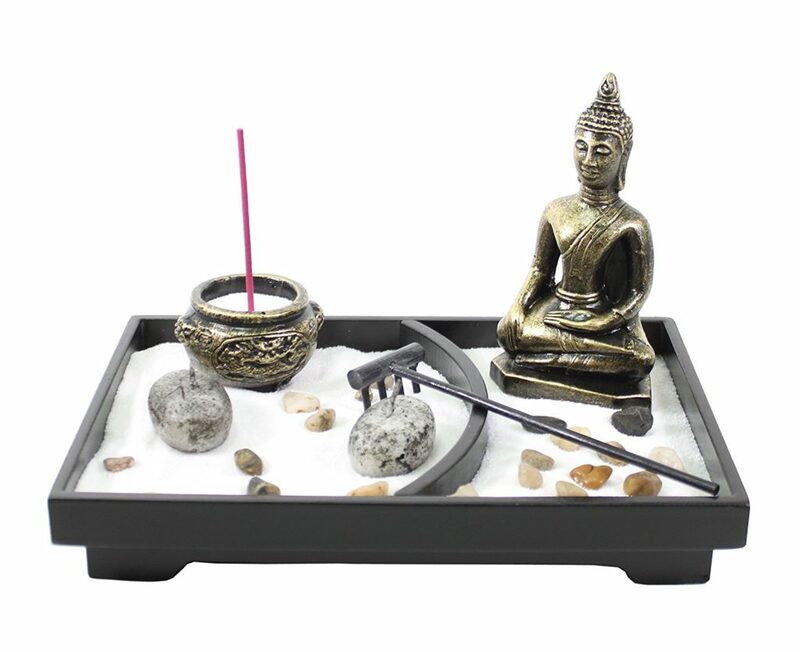 This beautiful mini zen garden kit includes multiple objects: sand, stones, a rake, a incense burner, a bag of incense, two candles and a Buddha statue. This kit is totally an eye-catcher in the room and you can definitely enhance your personality with this zen garden. Included incenses makes you relaxed and you can boost your mediation. Great kit for those who has practiced meditation for a while! Clear Quartz: A master healer, helping to remove negative energy, clear quartz is considered to be the supreme gift of Mother Earth. It balances mental, physical, emotional and spiritual planes as it opens the heart and mind to higher guidance. Clear quartz amplifies thought, energy, and the effect of other crystals. Amethyst: Amethyst crystal cultivates balance, peace, patience, healing, prosperity, abundance and sobriety. It’s used to enhance intuition and increase spirituality. Rose Quartz: Rose quartz nurtures the heart and provides comfort and emotional well-being with a gentle and soothing energy. Black Tourmaline: Black tourmaline is a protective and grounding stone that repels negative energies. It’s purifying and electrical in nature and is known to be empowering, encouraging good luck and happiness. Citrine: Citrine is bursting with positive energy. It kindles success, joy, abundance, self-confidence and personal power. Citrine improves mental clarity and enhances spiritual growth. This kit is perfect for spiritual people! How to use Mini Zen Garden? I have gathered here the most relaxing videos of making a mini zen garden. You can just watch and relax while listening these soothing sounds of raking the sand and moving stones. These videos also shows how to use mini zen garden. Please listen these videos with headphones. Enjoy! Having a rake with good quality is extremely important to achieve soothing meditation experience with mini zen garden. As the rake represents waves in the water, flawless lines aren’t easy to make. With a proper mini zen garden rake you can practice concentration and meditate effortlessly. 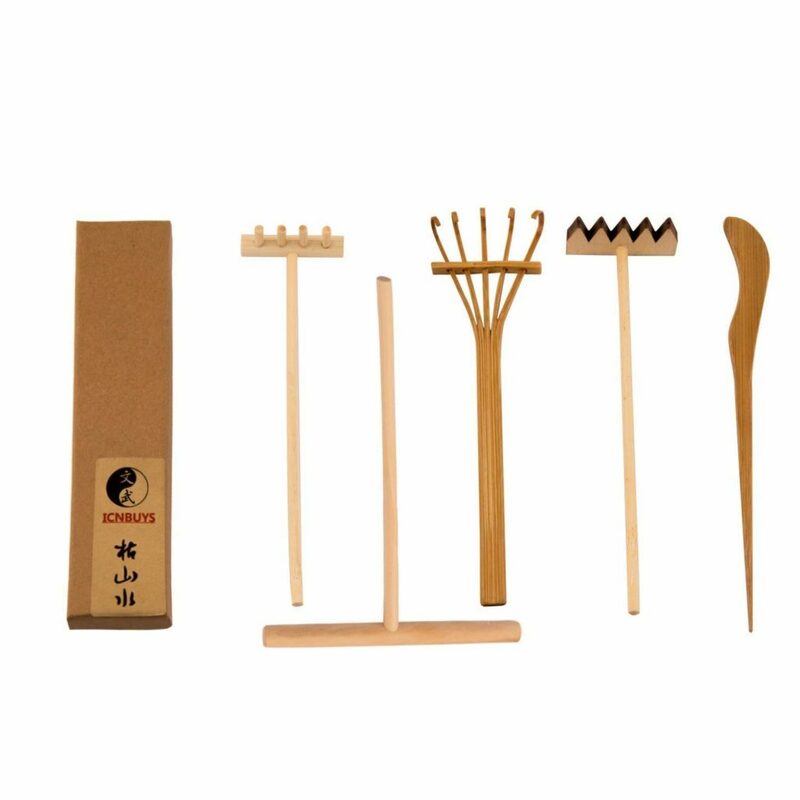 This mini zen garden rake set contains three different rakes, one bamboo drawing pen and one pushing sand pen. With this set you can make various patterns on the sand as all the rakes are different. 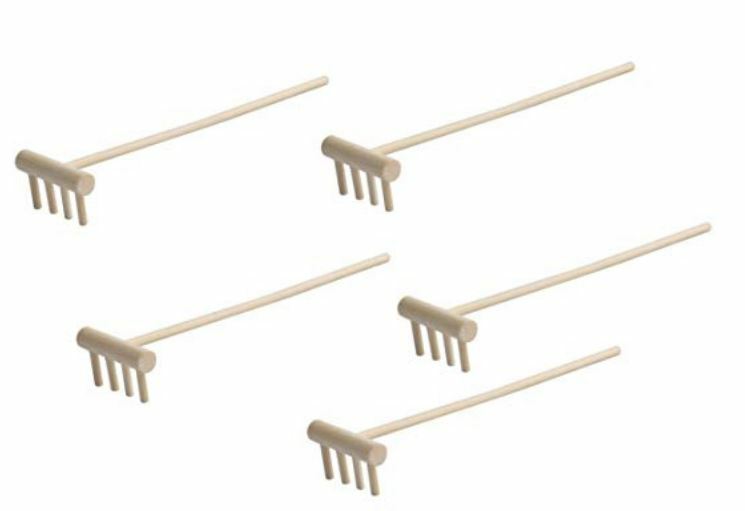 If you are looking for great mini zen garden rake set, this is the best set you can invest to. 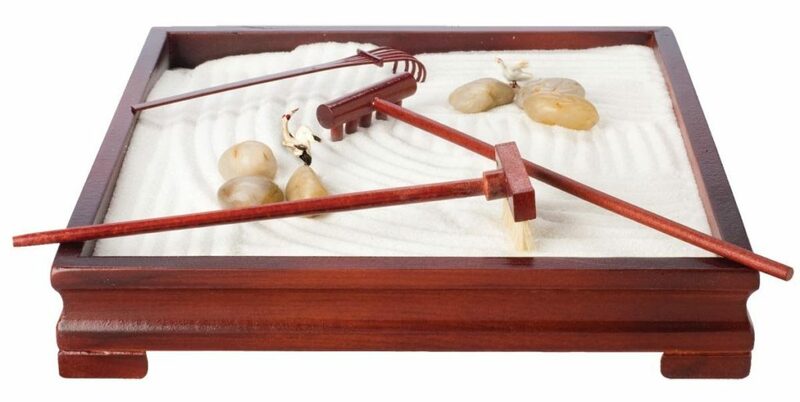 This set includes six different rakes to make your mini zen garden alive. Set is made from bamboo. Rake set contains four different rakes, drawing stylus and sand smoothing push rake for erasing designs and flattening the sand. Great set for someone who want to make creative sand patterns. 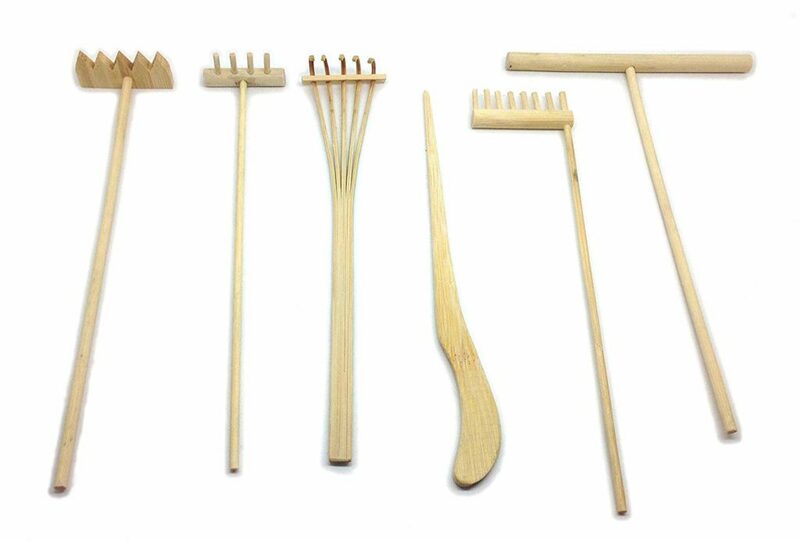 This is a very basic set of five rakes. Each rake looks exactly the same and they are made of wood. This mini zen garden rake set is excellent for those who are just getting to know the world of mini zen gardens.